Pochayiv Lavra Monastery | See you in Ukraine! The monastery was founded in the mid-13-th century, soon after the Tartar-Mongols overran Kyiv, by monks from the Kyivo-Pecherska Lavra, who fled from the invaders to the western lands of ancient Rus. Legend has it that the monks saw an image of Holy Mary on a hill and that she left her footprint. On the exact spot, the first Lavra church was built, and ever since that day, Mary is said to have been the monastery’s patron. According to the chronicles, in 1675 the monastery enjoyed divine protection from a massive Turkish army led by the infidel barbarian Nureddin. The Turks failed to overrun the defenseless Lavra because their arrows were redirected in mid-air to hit the archers themselves. Many of the Turks who survived converted to Christianity on the spot and joined the monastery. The Holy Footprint is one of the most fascinating relics at the Pochayiv Lavra. Pure spring water fills the footprint and it is believed to have healing powers for both body and soul, and all pilgrims try to secure at least a few drops. 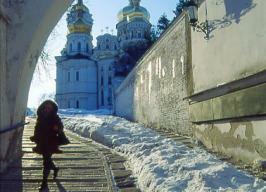 The main attraction of the Lavra is its Assumption Cathedral, an overwhelmingly Baroque affair. Its interior, which is capable of holding over 6,000 people, is a breathtaking expression of Orthodox iconography, with nearly every surface lavishly and masterfully painted and gilded with the images of saints and patriarchs. The cathedral was built in the 1780s by Count Mykola Pototsky, who, as legend has it, rejected his wild and immoral lifestyle after visiting the Pochayiv Monastery. The greenery of the Pochayiv hills, with their 300-year-old lime trees and the waters of a picturesque lake nearby with its peaceful swans and ducks, together with the twilight chanting of the monastery’s inhabitants, make for a special aura of spirituality very seldom found in the hustle and bustle of the civilized world.